Students rally for equal pay outside the Greensburg Courthouse. Photo by L.Swaney. Every year in front of the Greensburg courthouse, a group of activists from Seton Hill University participate in the Equal Pay Day rally. Sponsored by the Feminist Collective, the Equal Pay Day rally advocates for the end of the pay gap between men and women. According to pay-equity.org, white women in 2016 and 2017 who worked full-time year-round earned 80.5 cents to every dollar earned by men working the same amount. The pay gap is even larger for women of color, particularly for Latina women, who only earn 53 cents for every dollar earned by white men (equalpaytoday.org). Despite the Equal Pay Act, which was passed in 1963, women are still paid significantly less than men for doing the same jobs. This year the Equal Pay rally will take place on April 2, which is how far into 2019 white women will have to work to make the same amount that men earned in 2018. Again, for women of color that date is even later; Latina Equal Pay Day will not take place until November. The Feminist Collective has been sponsoring this event since senior social work major Lauren Swaney began at SHU. 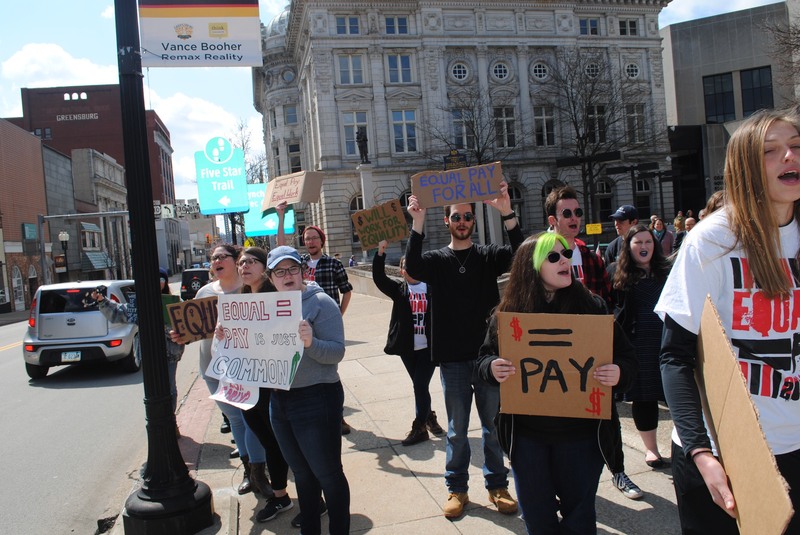 “The rally is a lot of fun to plan and participate in, but it’s also an opportunity to show the community that Seton Hill students are committed to transforming and bettering the world,” said Swaney, president of the Feminist Collective. Students and faculty of SHU, as well as local members of the community, gather in front of the courthouse with signs, megaphones and chants at the ready. The rally is an electrifying experience. Seeing so many impassioned individuals come together for a cause they believe in is inspiring. We live in a country built on its citizens peacefully protesting in the face of injustice. Through this act of rallying for what we believe in, we show our government what matters to us as a community, and that is equality for all its members. “Seeing not only the Seton Hill community, but also the Greensburg community, come together to respond to society’s inequalities” is Swaney’s favourite part of the rally. Everyone, whether they are members of the Feminist Collective or not, is invited to rally outside the courthouse beginning at 11:30 a.m. on April 2 to hear guest speakers talk about the importance of closing the pay gap, and to stand together for the cause of equal pay for all.